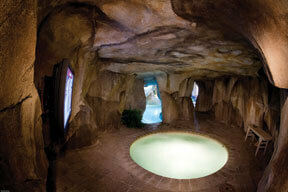 People who are interested in spicing up their pool design may enjoy having a grotto. 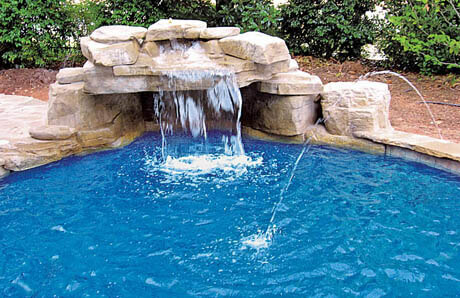 A pool grotto is usually considered to be a design feature that incorporates a waterfall over the top of a nook at the edge of a pool. Sometimes, any hidden space that is accessible from the water is called a grotto. Many different designs of pool grottos exist, ranging from simplistic seats to hidden spas. A grotto is typically a waterfall entrance to a space. However, other grotto designs exist, such as underwater entrances to spa rooms or small caves without waterfalls that can be used for a variety of purposes. Sometimes, either instead of a waterfall or in addition to it, the top of a grotto may incorporate another design feature such as a slide. The exterior of a grotto is usually made from a substance that looks like rock and landscaped to match the theme of the pool. Some of the more expensive grottos are made from real rock. The most versatile substance used is engineered concrete, but this is typically even more expensive than real rock. The most affordable grottos are made from prefab artificial rock. The two main parts of a waterfall grotto are the waterfall itself and the space behind it. The waterfall can be customized in height and width, but it is typically high enough to allow easy entrance by swimmers. In some pools, it may be high enough to accommodate people wading under it, as well. 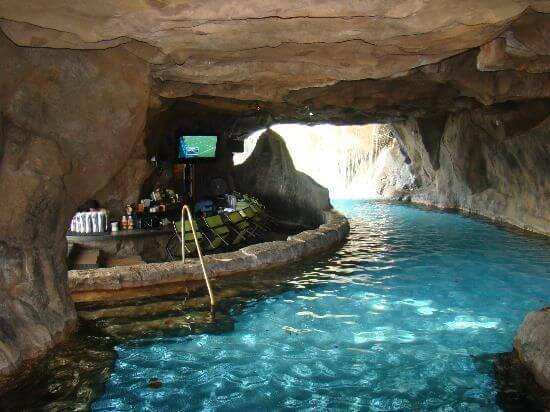 Other types of grottos may include entire rooms or features such as swim-up bars. Sometimes these grottos have dry entrances as well as access from the pool. Secret hideaways with lounge spaces, both in and out of the water, as well as spa features, loveseats, and play spaces are possibilities. How Much Does a Pool Grotto Cost? Pool grottos are not cheap, but they can be a reasonable addition to any mid-priced pool. Depending on what labor and materials costs are like in your area, pool grottos typically start at around $5,000 to $10,000. This is in addition to the cost of the pool itself, of course. 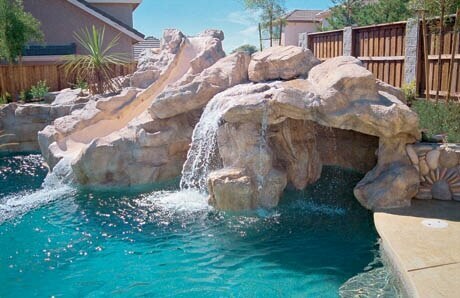 A waterfall grotto with a simple space behind it is usually the cheapest option. A staircase, slide, waterfall, and hidden nook might cost $15,000 to $50,000, depending on size, design, and building materials used. The sky is the limit when it comes to deluxe, elaborate designs that include things like entire rooms. A small waterfall concealing a modest loveseat in the water can be a great place to hide away with a special someone. Or, for people who enjoy bigger gatherings, a grotto with multiple benches or a round bench design can accommodate larger groups. Some designs feature places for people to get out of the water within the grotto, while others are contained entirely within the pool. 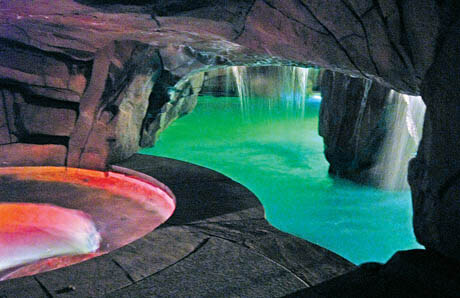 Lighting is another way to make a pool grotto special. Some people choose exterior lighting, while others stick with interior lighting. Anything from colored lights that lend ambiance to complete light displays can be used to enhance the appearance of the grotto. Budget will dictate what is possible for a lot of people, but even for those with a more modest budget, there are still options. People have come up with awesome pool grotto ideas for both adults and kids, as well as various features for people who like to relax versus those who want to bring the party to the pool. Many other types of pool grottos exist, in terms of both form and function. When designing or choosing a pool grotto, the pool owners and builders must take many different things into consideration. Some of the most important things include the design of the pool, the available space, the intended purpose of the grotto, and personal aesthetics. If you’re in the western North Carolina area, give us a call at and we can discuss grotto options for you!